Welcome to condo #101 at Polynesian Shores.This beauty offers a panoramic ocean view and is located steps from the water's edge. Waking up every morning to this view will leave you never wanting to leave! This spacious 3 bedroom condo with 3 bathrooms is just waiting for you and your family to arrive! Ocean views and fully stocked. What are you waiting for? Welcome to condo #201! 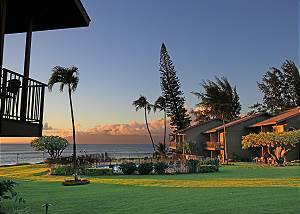 A wonderful three-bedroom, three-bath truly oceanfront end corner unit that has an 180 degree unobstructed view of the ocean, whitewater, and the neighboring islands of Molokai and Lanai. Welcome to Polynesian Shores #117. This tastefully decorated condo offers all of the amenities of home and then some. 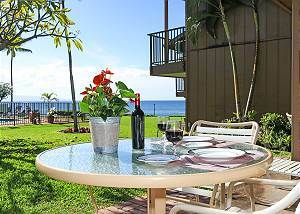 Having breakfast, lunch and dinner on this lanai will make you never want to leave! Welcome to Polynesian Shores #103. This condo serves as the perfect vacation destination. The unobstructed view of the ocean with the islands of Molokai and Lanai in the distance cannot be beat! 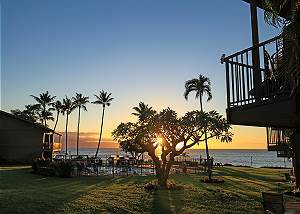 Polynesian Shores #108 is a fully stocked, tastefully updated condo that is a perfect location for your next - or first visit to Maui. This condo will feel so much like home you will never want to leave!! Welcome to Polynesian Shores #107. Just take a look of these photos and see for yourself why this would be the best spot for you. With the pool and the beach at your footsteps, what could be better??? Polynesian Shores is your spot if you are looking for peace and serenity in a tropical setting. Condo #109 is recently remodeled condo provides a comfortable Maui feeling with local hula and fish print art, and rattan furniture.